This script introduces the concept of “Member Cost”, which is the cost to have a member in your unit. The cost to have actors in the party is referred to as “Party Cost”. A party has a “Max Party Cost” property that is used to determine whether you can afford to have an actor in the party or not. The “Total Party Cost” is the sum of all costs for each actor. If the total party cost exceeds the max party cost, then actors cannot be added to the party. For example, if the total party cost is 10, the max party cost is 15, and you try to add an actor with a cost of 6 to the party, the actor will not be allowed to join the party because the total cost would then become 16.
it during the game through events. To change the max party cost during the game, you can use script calls. This sets the max party cost to the specified amount. There are two ways to calculate total party costs. One is to count only the battle members, the other is to count everyone in the party, regardless whether they can participate in battle or not. In the configuration there is an option to choose this. This script does not provide menu mods. It is up to you to add them to your own game. The demo comes with samples that you can use if you’re using the default menu. 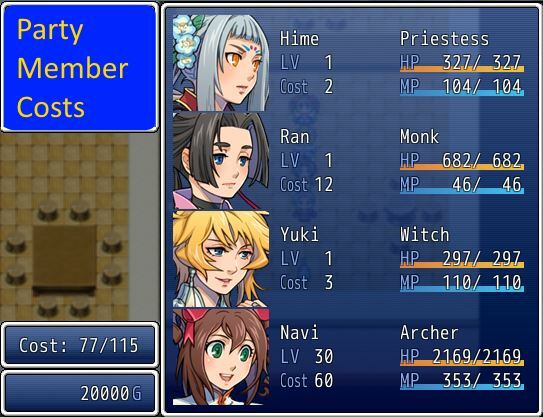 This was designed specifically for the situation where you have a fixed pool of resources, and each party member costs a certain amount of resources to have in the party. A mercenary plugin could be developed using this as a reference of course.